That's how Tony Benn summed up his own transformation from the man many in the Labour Party blamed for making them unelectable to the nation's political grandfather - whose stories and speeches mesmerised those who listened to him even when they scarcely agreed with a word he said. 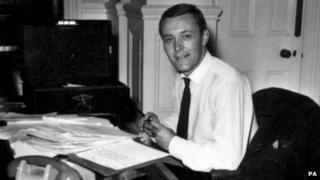 Tony Benn joked that unlike many radicals he'd become more left-wing as he'd grown older. Harold Wilson quipped that Benn had "immatured with age". In his early political career he was the slick, presentable TV face of Labour but he ended it by campaigning against pretty much all that New Labour stood for. It needed a court case to allow him to continue as an MP - he had to renounce his hereditary peerage to do so - only years later to leave Parliament so, he quipped, he could spend more time on politics. The seeds of that transformation were sown in the 1970s, in the battles fought within Harold Wilson's Labour government. One in particular was to shape the future of British politics for years to come. It was over Europe, or the Common Market as it was known then. Benn believed Europe robbed ministers of the power to do anything very much. He had become disillusioned with Labour's failure to change society, complaining later that it had, instead, changed people to make them accept society as it was. When Wilson agreed to a referendum on Britain's membership of the European Economic Community he allowed his ministers to take opposing sides. Benn led the antis. His cabinet rival Roy Jenkins led the pros. The two men debated head to head in the BBC Panorama studio. Within a few years the Labour party had split, allowing the Conservatives - first under Margaret Thatcher and then John Major - to win four elections in a row and to govern for 18 years. Benn blamed the "traitors" led by Jenkins who abandoned Labour and created the new SDP - a forerunner of today's Lib Dems. Jenkins and his acolytes blamed Benn, who'd led a popular revolt in his party crusading successfully for a party whose manifesto pledged to take the UK out of Europe and Nato, to give up nuclear weapons and to nationalise major industries. It was to become known as "the longest suicide note in history". Tony Blair's New Labour was, in essence, a complete repudiation of Benn-ery. It led Tony Benn out of Parliament and on to the streets to campaign for socialism. As he was seen less on our TV screens he was seen more at protests, rallies and campaign meetings. To many he was a voice of inspiration, with his warnings against globalisation, corporate power and American adventurism. His ability to draw deeply from British history - whether the Levellers or the suffragettes - and to range widely, from the global politics of the Arab street to that of your local estate, made him a far bigger figure than the adviser-turned-politician, PR-schooled technocrats who followed him. It is, though, not for any of this that I suspect he will be remembered in 100 years' time. It is his eight volumes of diaries - a chronicle of post-war British political life that will mean that he is never forgotten. When I visited his house I saw the museum of recording technology that made that possible - from the earliest BBC Apple computer to an 8-track twin-reel recorder. All still necessary to access the words and the sounds that Tony Benn recorded each and every day. The first political book I was ever given was Tony Benn's Arguments for Socialism. I had the privilege to interview him, to be interviewed by him - for a programme on the power of the media - and to be teased by him. "You're an embedded journalist now," he told me during the Iraq War. On every occasion I met him he was forceful and stimulating and charming. Tony Benn always insisted that politics was about issues not personalities (or ishoos not pershunalities as it sounded from his lips). The irony is that the man who meant that sincerely was, himself, one of the biggest political personalities this country has ever seen. PS. Thank you for sharing your pictures of Tony Benn during some of his many appearances at marches, demonstrations and political meetings. Here is a selection. Image caption This photo, sent in by Rebecca Michael, is of Tony Benn at a pro-Palestine demonstration in April 2002. Image caption Faizan Fiaz, from Islamabad, sent this picture of Tony Benn speaking at a rally in 2012. It was a cold and rainy day but the speech was inspiring, he says.